Home Dining Eating Vegan and Vegetarian in Astoria! Eating Vegan and Vegetarian in Astoria! Astoria is a food Mecca, there’s no doubt about it. When we checked out Ginger the other day, we realized that there’s a lot healthier options popping up in the neighborhood, especially some vegan and vegetarian ones. So, here’s our fave vegetarian and vegan friendly spots! Some of these are completely vegan, while others have an expansive list of vegan and vegetarian options on their menu! PIZZA. Oh boy, do we love pizza. Classic, New York City style, thin crust is what you’ll find here. They’ve got a slight…”hipster,” vibe, and some of the pizza ideas are unique, to put it best, like the Corn on the Hog, with mozarella, corn, goat cheese, arugula and bacon, but even those are worth trying. 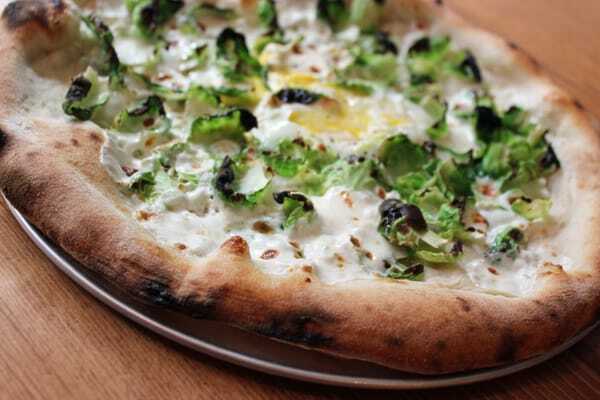 Our favorite here is the Van Dammer – a pizza topped with mozarella, egg, brussel sprouts, cracked black pepper and truffle oil – because anything that can make brussel sprouts taste amazing is a-okay in our book. Enthaice does not disappoint, and if Thai food is what you’re craving, it’s definitely one your best choices in Astoria. The food here is consistently flavorful and well-prepared, but what we really love here is the atmosphere, and the service. The waitstaff always seems to go out of their way to be extra-friendly, and it’s a great addition to some awesome food. If you’re picking a vegetarian option off their menu, we’d recommend the Enthaice Delight, which includes sauteed asparagus, snow peas, carrots and shiitake mushrooms in a brown sauce. If spicy food is your thing (it’s totally ours), you can ask them to kick it up a notch and it takes the entire dish to another level. Sometimes, you just want to bite into a big, juicy burger. But vegetarian burgers can be EXTREMELY hit or miss, and either taste like cardboard and are made from who-knows-what random vegetables thrown together in an awkwardly chewy patty, OR they’re marvelous and flavorful and melt in your mouth perfectly, and you can breathe a sigh of relief. Bareburger is the latter. Phew. Bareburer has a complete vegan option, and it includes a black bean patty, vegan cheddar, green leaf lettuce, tomatoes, raw red onions and cilantro lime dressing, and hooooly moly is it good. The patty is perfectly creamy, and coupled with the vegan cheddar is absolutely flawless, with the lettuce and red onions adding a crunchy kick to it. The cilantro lime dressing adds a nice dimension, but it’s not my personal favorite – which is totally okay because you can build your own burger, and change up anything you want. GUYS. THEY HAVE VEGAN CHEESE. AND VEGAN SOUR CREAM. And it tastes legit. AND MEXICAN FOOD IS GREAT. The De Mole Nachos are an awesome appetizer, because you can never go wrong with nachos. It’s their awesome corn chips topped with black beans, cheese, guacamole, pico de gallo and sour cream. You can get the cheese and sour cream substituted with the vegan options, and it’s a great crunchy snack or appetizer. They have seitan, which if you guys don’t know is a vegan “meat,” and a pretty good subsitute. They seitan burritos or fajitas are absolutely amazing, and you can barely tell that you’re having a vegan option. We’re also really big fans of their guacamole and pico de gallo, both are always fresh and yummy. The Queens Kickshaw is definitely more vegetarian friendly than vegan – but there’s options for both, nonetheless. The grilled cheese here is seriously to die for, and it’s nostalgic without seeming outdated. 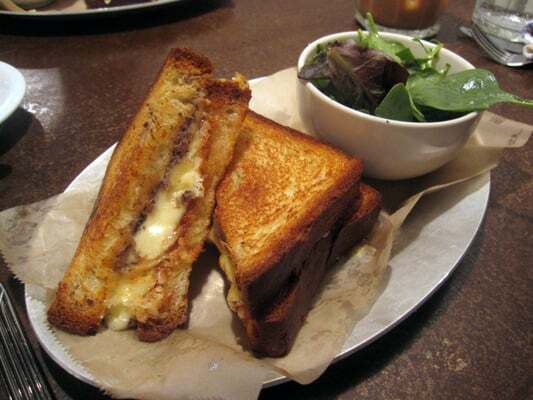 The grilled cheese, while reminsicent of the grilled cheese your mom used to make for lunch with tomato soup, is completely kicked up, with adult-options that are unique, inspired, and tasty. Our favorite is the Gouda, with black bean hummus, guava jam, and pickled jalapenos. It’s served with a green salad with jalapeno vinaigrette. There is so much going on in this sandwich! First, you’re hit with the creaminess of the black bean hummus, but then you crunch into the spicy pickled jalapeno and your mouth is assaulted with all this amazing jalapeno juice, and then the guava jam perfectly balances out the spice so you’re left this amazing jumble of hot and sweet and it’s absolutely perfect. As a main dish, their roasted vegetables and eggs are always spot on, with balsamic glazed fingerling potatoes and brussel sprouts. Next articleHunting for Happy Hour in Astoria!